There were many happy faces around the Home when news spread of Giggles' adoption during the recent adoption drive. He had been patiently waiting for 96 days. Our adoption centre has been a hive of activity over the past couple of weeks, with more than 267 cats and kittens finding new homes. But, there is one furry face who seems to be overlooked. Giggles has been awaiting a new home for 96 days; that’s a long time to be without a family! 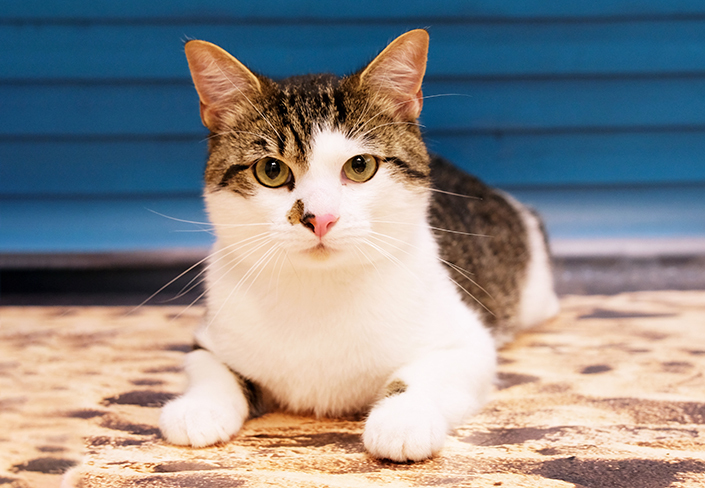 We’re shining the spotlight on this fun-loving, affectionate cat to help him find a forever home. Courtney, cattery attendant at the Home, has formed a special bond with Giggles during his time at the shelter. “He’s not like any other cat that we’ve got here; he’s definitely one of a kind,” said Courtney. “He’s a lovely cat and he deserves the best home. I just love his personality; I love the way he acts. As soon as he sees a person or something, he just lights up. “Giggles would suit any type of home. He’d be good with dogs and cats. He’s a pretty active cat; he’d live an active lifestyle,” said Courtney. Interested in adopting Giggles (ID 1020339)? View his adoption profile or meet him at the Home’s North Melbourne shelter. If you’re not ready to adopt, please spread the word to help Giggles find a loving new home.